Watch this intriguing, six-second NASA video of a strange, UFO-like object near the Sun captured by a NASA satellite telescope. This UFO video is greatly accelerated from the actual event. If the video doesn't start in a few moments, you need to Get the Flash Player to watch this video. The above time-lapse NASA video displays 48 hours of activity on the sun from 8 AM on March 10 to 8 AM on March 12, 2012. So in reality, the event moved nearly 30,000 times slower than what you saw. 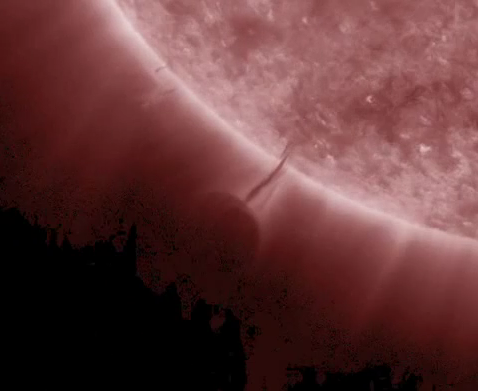 The video was taken using an orbiting telescope in NASA's Solar Dynamics Observatory. Now let's slow it down to 1/4 of the speed above, so one second is equivalent to two hours. NASA's Solar Dynamics Observatory (SDO) was launched on Feb. 11, 2010. SDO is unique among satellites in its sole focus on studying everything about the Sun. You can learn more about the SDO on NASA's website at this link. NASA has also developed an incredible website specifically to support the SDO, where you can see the entire Sun or any portion of it now or in the past. By typing in the exact date and time on the website, you can view any previous recordings of the SDO. Using this awesome website, you can actually recreate these UFO videos yourself. To do that, first click here. Then click on the "Movie" link at the top right of the image. In the menu that drops down, click on "Full Viewport." Next, set the duration for two days. Then click on the little wheel (settings) next to the question mark at the top right of the drop down menu. Click on the button in front of the word "Length(s)" and select the length in seconds you would like the video to be. Then just click on "OK." The two videos above were 6 and 24 seconds in length respectively. Using the same process, you can change the time covered in the videos and change the actual video length very easily. Here is a 75-second video covering the period of March 1 - 15, 2012, so you can see what happened before and after the event you just watched. In this video, every five seconds covers 24 hours of solar activity. To see the same time period at about 1/4 of the above speed, click here. To achieve higher quality in these videos, several shorter videos were spliced together in most of them, as the frames-per-second rate is slower if you use the settings available on the SDO website. Now the big question. What is it that you just saw? Note that the Sun is not known to have any clouds, so what are those cloud-looking objects? And what is the more solid-looking object that then appears out of the "clouds"? If you look at it without any mental filters, it looks like the edge of some sort of large, unidentified object which is creating a link to the Sun, and then drawing the Sun's energy up into it. Yet could this actually be? Most readers will likely think that is impossible. If you research Sun activity, you will see that this cannot possibly be a solar flare, as they generally last only a few seconds to an hour. The longest solar flare ever recorded was 22 hours and 48 minutes. Yet the funnel-looking object in these videos lasts well over 48 hours. Another possibility that has been put forward within the realms of current scientific understanding is that this is some sort of solar prominence. According to Wikipedia, "A prominence is a large, bright feature extending outward from the Sun's surface, often in a loop shape." These forms can exist for hours, days, and even months, though scientists are still studying how and why they are formed. This would be the most logical explanation and is what most who have scientifically investigated the above event have concluded. Yet there are questions about this explanation. If you look at the hundreds of images of solar prominences available here, you will find exceedingly few that look anything like this phenomenon (other than images of this particular event). And a funnel retaining its shape for days is far outside of normal for a solar prominence, though some claim it might be what's called a "filament channel." Yet look at these images and videos of filament channels. Not very convincing. Another strange anomaly can be seen in the one-minute video covering 15 days above. Notice that the Sun there is clearly rotating while the cloud-like object is stationary relative the SDO and Earth. The strange object hardly moves at all while Sun's surface rotates. If you watch the many videos of solar prominences available here, you will see that they move in relation to the rotation of the Sun. They are not stable relative to the camera, as this object is. The beautiful one-minute video below of the full Sun for 28 days further demonstrates this. The above video covers the 28 days at the Sun from March 1 - 28, 2012. The event in question, though small, is visible in the lower left corner around 20 to 24 seconds into the video. Notice how everything happening on the Sun moves along with its rotation, except for this one strange event. And then there is the question of why the large object which appears attached to the end of the funnel so suddenly (in relative terms) seems to take off from the Sun and disappear into space, leaving a wake on the Sun's surface. Watch the 12 hours over which the object departs below. Notice what appears to be the effluent of the object in the above video. With normal solar flares and prominences, once the substance is ejected from the Sun, it is subject to the intense gravity of the Sun, so that it first decelerates as it is shot upward, then rapidly accelerates as it falls back to the Sun. See this video for an example. Yet both the strange object and some of its effluent in the above video slowly accelerate away from the Sun, picking up speed at the end. How do you explain that? For another event on May 25, 2012 in which a similar object to that above blocks a filament ejected from the sun, watch the 2 1/2 minute video at this link. What kind of object could both connect with a filament as in the first videos above and then block a filament like in this video? Most scientists believe that all advanced life forms must be carbon and water based. Yet is this really a reasonable belief? Why would there be only one way for life to be formed? How do we know that there might not be many different ways life can exist in this physical reality? Is it not possible that life might come into being in a very different way at extremely low or high temperatures? Is it conceivable that there might be life forms that exist only in a gaseous state? Could there be plasma-based life forms that might even have developed advanced civilizations? Some people believe that the entire planet Earth and our Sun are sentient beings that have a life of their own. Who knows? And who knows what the above solar event really was? Maybe it was just a very strange solar prominence. Yet then again, maybe it was some sort of plasma-based, other-worldly craft or being which occasionally visits the Sun to recharge its energy stores. Or could it be something entirely different all together? Life and the universe are filled with strange mysteries. Let us keep an open mind and not come to rigid conclusions too quickly on such matters. For those interested, below are links to a number of videos of the above phenomenon of varying lengths and time frames. Enjoy, and feel free to speculate and even let your mind run wild, if not just for the fun of it. And if you are open to some solid, reliable evidence that there are intelligent beings that originate from outside of our world, and who may even have visited our planet, see the excellent resources listed in the "What you can do" section below. And have fun exploring! Inform your media and political representatives of this intriguing phenomenon. To contact those close to you, click here. Urge them to explore what's really going on with the UFO question and release all classified documents to the public.